The seminar was structured in such a way that it benefitted beginner advanced and intermediate. The techniques utilised were the basic or fundamentals and accessible to students of differing ability and skill. There were some key learning points to take away and implement, and over this last week I have heard students and instructors alike saying that they had been “training” or doing “lin gung”, as is explained below. So what did the seminar tell us about our combat strategy and philosophy? 1. We were asked to think about what the most important thing is that we have to defend ourselves in a real situation. Students answered eagerly and well. The answer coming back from Sifu Garry (Si Fu) was that “You are the weapon – do not neglect the body conditioning”. To achieve this, a wing chun martial artist must maintain good stamina. Sifu stressed the importance of punching and training every day, saying “you must punch every day to be serious about your wing chun and be a martial artist. In this way you are preparing and in readiness for combat. In days of old, if a martial arts Sifu ordered students to do 1000 or 2000 punches a day it was done without question. But things have rather changed nowadays. 2. Lin jap and Lin gung. SIfu explained to students that we must understand the difference between practice, as in class practice to develop the techniques, this being “Lin Jap” in Cantonese, and training to condition oneself and push oneself to become better and combat ready, this being known as “Lin Gung”. 4. The first half of the seminar looked at developing that endurance through practice in a non-pressured situation. Students were able to test their own stamina and mental endurance under no-pressure or threat by doing some basic exercises. Simply chain punching focus pads for 3 minutes continuously. Suffice to say, no one really lasted the 3 minutes without slowing, faltering and some struggling to continue! A real eye opener. This was followed up with similar timed drills using turning punch, arrow walk up and down. Sifu then concluded by explaining the purpose of the drill. Ideally we would like the fight to be over in 3 seconds, but it could go on for much longer, therefore we should train and expect a fight to last up to three minutes. Therefore we must train at full force for three minutes on all the basics. This is so because we may not just be faced with one attacker with one heart and one pair of lungs. Rather we may be faced with two or more attackers, in the former case, two hearts and two pairs of lungs fighting one person. This demands a high level of stamina and also other elements to be brought into “Lin Gung” or training. There are four important elements to work into our training. As well as stamina or physical endurance, we have to work on speed, power and accuracy. Some of these can be built into the simple 3 minute drills as above. 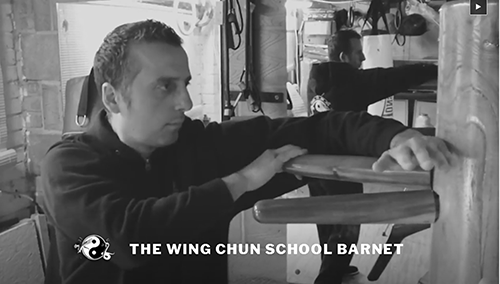 There are numerous other ways to develop these which this review won’t be addressing and which every instructor of The Wing Chun School will help students to develop and integrate in their training. The first half of the seminar Sifu Garry commented on the modern phenomena of what I might term as arm-chair or spectator martial artists. In a voice expressing astonishment and surprise he explained that today’s martial artists like to be impressed by others, for example on YouTube etc and to also praise others’ work. But these same martial artists neglect to develop themselves. Sifu Garry said he was not impressed by anyone, but is certainly impressed by someone who trains and follows their system, in whatever martial art they are involved in. They are better to look at their own training. We follow a system, and that is why we can see that system expressed in all the students. I’m looking forward to the next seminar. In the meantime Sifu reminded us to keep training so that the next seminar can build on what we have covered.